1. Maxing out the credit card: House Speaker Paul Ryan, who built his career on the promise of fiscal responsibility, is leaving behind a looming $ 1 trillion budget deficit. In the short run, Ryan’s signature achievement of tax cuts could extend the life of America’s recovery from the Great Recession. Yet those same tax cuts, enacted during a time of broad economic health, have helped increase America’s already bloated budget deficit. In other words, the United States won’t have the financial resources, precisely when it needs them. “It will dramatically reduce the ability of fiscal policy to respond to the next downturn,” said Michael Gapen, chief US economist at Barclays. Because of the Republican tax cuts — and recently enacted bipartisan spending hikes — the Congressional Budget Office now expects the federal government to run a $ 1 trillion budget deficit in 2020, two years earlier than previously anticipated. That’s the kind of red ink normally reserved for a downturn, not a boom. Yet the US economy is nowhere near a recession, raising questions about the wisdom of providing expensive support that wasn’t really needed. “It’s not what traditional economic theory suggests is appropriate fiscal policy at this mature stage of the business cycle,” Gapen said. Consider that interest payments on US debt are on track to quadruple to $ 1.05 trillion by 2028. At that point, the deficit could hit $ 2 trillion if current policies stay intact. Guggenheim Partners, a New York investment firm, recently predicted the next recession will arrive by the end of 2019 or 2020. Hedge fund billionaire Ray Dalio says there’s a 70% chance of a downturn before the 2020 presidential election. It nabbed its first Academy Award for the documentary “Icarus,” struck a deal with Verizon (VZ) and expanded a deal with Comcast (CMCSA). The stock has soared more than 60%. 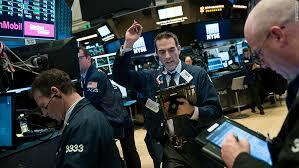 And Deutsche Bank (DB) analyst Bryan Kraft raised his price target to $ 350 a share, 12% above its Friday close. Over the years, GE has made a string of bad decisions. In 2016 and 2017, CEO Jeff Immelt went on a $ 24 billion spending spree to buy back GE’s stock at what turned out to be extremely high prices. The buyback squeezed GE’s cash haul and increased its debt. That huge debt load has forced GE to scramble for cash by selling even more businesses — a strategy that will eat away at future profits. 4. More banks report earnings: Wells Fargo (WFC), JPMorgan Chase (JPM) and Citi (CITI) reported earnings on Friday. The news has been good so far: JPMorgan posted a profit of $ 8.7 billion for the quarter, an increase of 35% from a year ago. Even troubled Wells Fargo beat analyst expectations. Bank of America(BAC) is on deck for Monday, Goldman Sachs (GS) is reporting on Tuesday, Morgan Stanley (MS) on Wednesday and Bank of New York Mellon (BK) on Thursday.